Yikes! That looks like a bad Black Friday. This is Scarlet and she's angry with Santa for not bringing her more treats. She's been a good girl so she deserves more treats right?? I happen to think so too. I mean, us black pugs should get extra treats just because we're extra beautiful (sorry you fawnies). Scarlet is totally into yoga. She likes to be mellow and chill out, well when not shredding a new toy. I heard you can do doggie yoga, but since mom says I have the attention span of a flea I don't qualify. I'm not the most agile of pugs, so I believe this is in my favor. So to get your Monday going, sit back in awe of this cuteness....and all you fawn pugs wishin' you were a black pug...eat your little fawn hearts out! Scarlet is adorable! But Bella, I think that you're jealous of us fawns cause we stay a bit cooler in the summer heat and sun! Anyway you cut it (or color it), us pugs just can't be beat! Scarlett is cute but you are cuter. 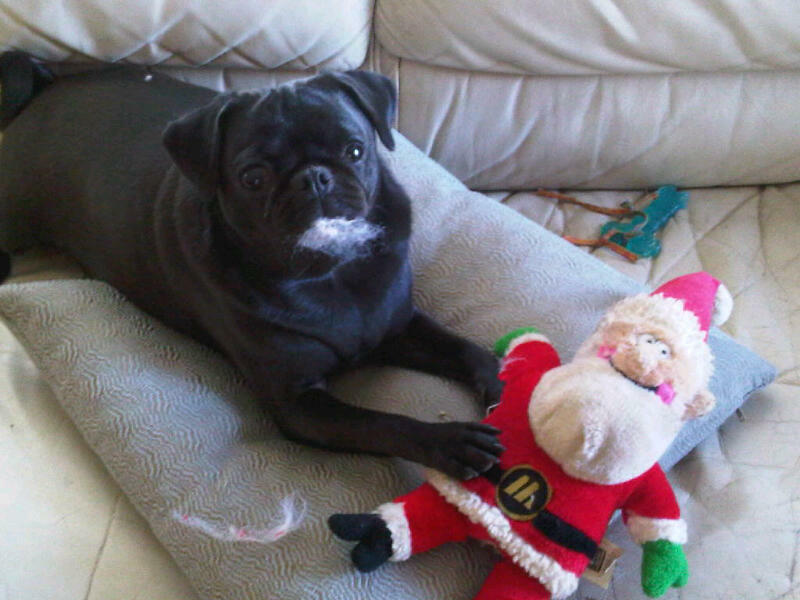 I pugsonally think Santa totally spoiled me and would NEVER tear up a Santa stuffie for feat of bad Juju. All my best buds are fawnies...including my main squeeze Spencer. I agree you are lucky in the heat, but during winter you can spot me in the snow! Don't eat the yellow (or brown snow) Snorts!! Hey Noodles, shucks you're lucky I'm black so you can't see me blushing. I can't wait to meet you!!! I'm a black pug in disguise! That Scarlet is really cute and mellow. I sure wish I had the attention span to do yoga. I'm working on my inner yogi but it's hard not to be a spaz! YAY!!!!! Thank you for such this special honor!!! All puggies are beautiful and highly intelligent too :) So glad we're in such great company. oh we LOVE miss scarlet! she is so wise and flexible! the perfect yogi combo! your post made our day!